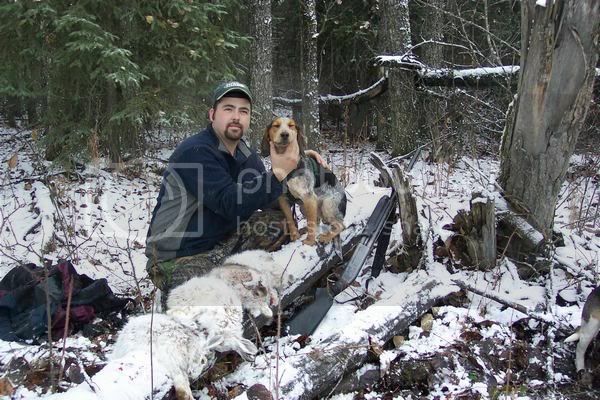 Thread: Alaska Outdoors Directory rabbit hunt??? I was wondering if anyone would be interested in Rabbit hunitng? This would be nice way for all of us get to meet each other and. I'd be up for it. Keep me posted. I'd go too, rabbits are fun and tasty, just gotta wait for the first snow/melt. Well lets what for the first good frost to hit. I'm up for any place. So if you guys have a spot that we all can meet that would be great. If anyone sets one up in the fairbanks area I would be up for it, Im new to hunting in Alaska and a little unsure where good places are. If anyone has some areas they wouldnt mind pointing me that would be a big help. I was south of Delta between pump stations 9&10 in July. There were an enourmous amount of rode kill rabbits and 3 times that many along the road alive. I have never seen rabbits so thick. However that is a bit of a drive for most of us. Duxhuntin I'd be into a Fairbanks rabbit hunt as well, anyone else out there in Fairbanks??? Hopefully everything works out and in Oct. We all can meet. I live in Wasilla but my son moved to Fairbanks yesterday. I'm game for about anything, sounds like fun! I would be up for this in the Anchorage area. Is this a "guys" only type thing? If not would you consider me & my 10 (almost 11) yr old son? I live in the valley and work FT m-th. Let me know either way. What would be the preferred gun? Is this bows and guns? I will bring my bow and have my shot gun in the car. For me it depends where we hunt. If it's wat to thick where I can't use my bow then I will break out the gun. Also I could bring my beagle if anyone wants to hunt that way. He is a rabbit chasing machine!. Im in Anchorage also. Here is what he is capable of in a couple of hours!